Religion and The Only Person I Can Control | The Better Plan . .
Have you ever heard the phrase, God hates the sin, but He loves the sinner? I have heard it quite a bit over the last several years, usually in connection with points that religious people want to make regarding sexual identity issues. I haven’t been totally comfortable with the phrase, but couldn’t put my finger on what exactly was causing my discomfort. I had forgotten where the phrase comes from, but was recently reminded that it appears in the little book, Steps to Christ, one of my favorites and a choice theory classic. He hates sin, but He loves the sinner. The truth seems to be that “God hates sin,” all of it, because it separates us from Him and hurts us in every way throughout our daily lives. He hates that we have to deal with fear and insecurity and coveting and lust and power struggles and self-medicating and addiction and vulgarity and dishonesty and . . . you get the picture. He hates anything and everything that screws us up and causes us pain and distress. He hasn’t given us the responsibility of convicting others of their sin (thank you for that, Father). The Holy Spirit takes care of that and He is really, really good at it. (John 16:8) It is amazing how gently and lovingly the Spirit can bring us into an accurate picture of ourselves. The important thing is (since the only person I can control is me) that we each respond to the promptings of the Spirit and, through Him, bring our thinking and our behavior more and more into alignment with His. The only person I can control is myself. This is a key internal control element of choice theory and it is especially important when it comes to our spiritual journey. Self-control is a noble goal for everyone, whether they are into religion or not. Since self-control is one of the fruits of the Spirit in Galatians, it is definitely important to a Christian. Our need for love and belonging is met as we are in good relationships with others. Being judgmental and critical toward others hurts these relationships. As much as anything Jesus emphasized that we love one another. Our view of reality is based, to a great extent, on the quality world pictures we believe and value. We see the world differently as our values shift. People that travel to poverty-stricken areas of the world are often changed by what they see and hear and smell and touch. They no longer see their own abundance in the same way ever again. This is great Prof. Roy. Thank you for sharing this. Thanks for the loving “food for free thought.” I actually was just talking about this idea with my husband. I think you might also like this blog post on the topic. Thank you for that clarification on the actual quote. I too have struggled with this saying. Fantastic post! 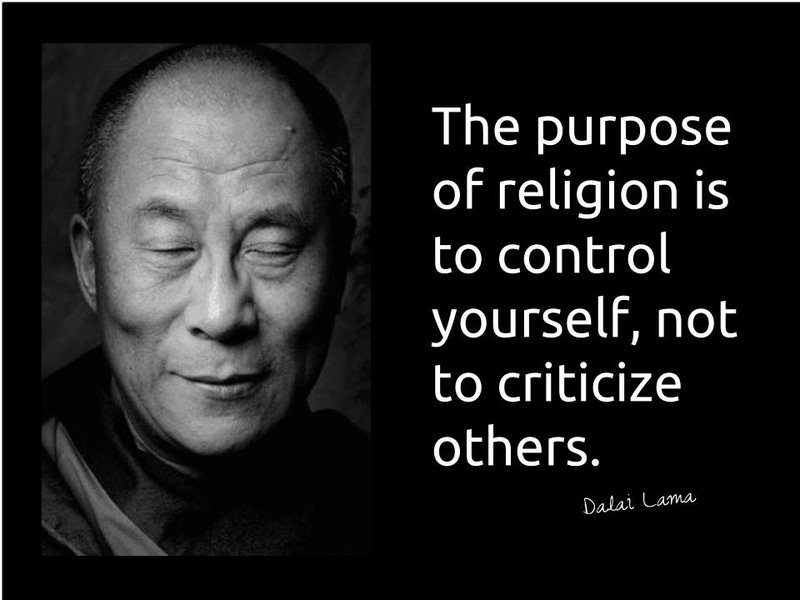 Great explanation and the Dalai Lama quote particularly struck me. I’ve just finished reading several posts. Now I’m missing our Sabbath School class again. Thanks for making us feel less alone in our spiritual journeys.